Beard oil? You might be asking yourself why in the name of all that is manly and true would you need any sort of product in your beard. Anything oiled when it comes to personal care products has a distinctive feminine feel to it: Our wives and girlfriends use rejuvenating oils in their hair and Oil of Olay on their skin. The typical beard-wearing man wouldn’t be caught dead using Oil of Olay to smooth out his hands, even if he were all alone. On a deserted island. In the middle of the ocean. After a zombie apocalypse killed everyone else. But if you’re serious about your beard aka Beard Serious or quite simply Beardious, you can grasp the truth that beard oil is not a frou-frou gift store throw-in, but a legitimate product that can transform your scraggly tufts into a lush, full beard that makes you feel good and look good. 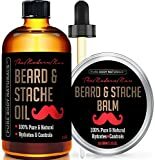 Now before you go down plunking down your hard-earned money on a case of beard oil to last you for the rest of the decade, it’s imperative that you know the ins and outs of the substance to ensure you’re selecting the best kind to put your best beard forward. 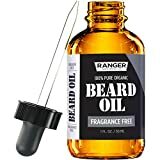 Still having trouble coming to grips on putting oil in your beard? Understandable. But to make it easier to comprehend, let’s stop thinking facial hair and head out to the garage for a second. You’ve got a ’65 Ford Mustang tucked away in there. Truth be told, we both know it’s probably really a Toyota or a minivan, but we can pretend for a moment or two. You drive it every Saturday night up and down the main strip of your town and have it waxed, washed, and purring like a kitten. You only put premium in it, and to make sure it’s running at absolute precision, you go beyond what the 50-year-old manual says and change the oil every 3,000 miles. Yep, the light just dinged in your head. The oil. Just like how the oil of the all-American dream machine keeps its engine cleanly humming along, so too does beard oil ensure your facial hair and the skin beneath it are looking their best and feeling that way too, each and every day of the year. Your beard might not be a machine, but there’s no doubting the difference between what it looks like at optimal performance and when it’s itchy and unkempt. What’s In a Good Beard Oil? Continuing on our previous automotive allegory (2 Word of the Day Calendar entries in one phrase! ), not all beard oils are made equally. Ford blessed us with the Mustangs, but tried to shuck the Pinto off on us. Too young to remember the Pinto? It had a small design glitch in which if the car was rear ended it would catch on fire … and then it explode. Lower-grade beard oils aren’t going to blow your beard off your face anytime soon, but using the wrong product can be damaging to both your hair and skin. So what are the top ingredients and which ones are more ‘meh’ for your money? Here’s a closer look. Aragan – No, not Viggo Mortensen’s character from Lord of the Rings, these are trees that grow in Morocco. Hair care experts call the stuff “liquid gold”, which quite frankly is an insult to Texans like myself who use that phrase for crude oil, but you get the point. Argan oil is really perfect to use if you work outside or in excessively dry conditions. Jojoba – Next time you’re out driving in the Sonoran or Mohave deserts, stop on the side of the road and you can pick some yourself from the shrub know as Simmondsia chinensis. Jojoba comes in a liquid wax form that allows the plant to survive the harsh summers and chilly winter nights in the deesrt and it can do the same for your beard, keeping it healthy and soft all year. Grapeseed Oil – There’s no shortage of grapeseed oil in the world, so lots of economically-minded beard product companies use it for their wares. That’s all find and good in the short term, but grapeseed oil goes rancid after a while. If the company selling it has had the product in stock for a fewmonths, it might be rancid when you get it, and that’s not good for anyone. Coconut Oil – If you have children under the age of 12, I bet you spent most of the last six months singing “Consider the Coconut” from the Disney movie “Moana”, because as the dad of five-year-old twins, you better believe I know that song by heart. For some people, coconut oil is a great fit and it smells delicious; but for others it reacts poorly with their body chemistry and gives off an odor reminiscent of an old shoe. Olive Oil – Not Popeye’s girlfriend, we’re talking about the stuff that you cook with that for some reason costs $6.59 for a 4-ounce bottle. Consider this a quick-fix for your beard as it is greasy and that makes it tough to wash out. On the plus side it can knock out damage done by cheap beard washes and conditioners. The best part about beard oil is that if it were any easier to use, you could do it in your sleep. Make sure you apply it right after a hot shower, because that gives your pores and hairs their cleanest, softest, and most accessible environment. Completely dry your beard before using the beard oil; water and oil are not friends and don’t play well together. Use an eye-dropper to get 2-3 drops of beard oil and rub it on your palms. Rub your hands through your beard – side to side, bottom to top, top to bottom. Basically you want to emulate the hand gestures of an NFL general manager who has no idea who to take with his next draft pick. Use a comb to complete the even distribution of the oil and set your beard in the style you want it. You’re done! And you’ll see results quickly as your beard shows more luster and a thicker look as the hairs are revitalized. And if you do go for one of the cheaper options, be smart about it and only use them as long as they are smelling good and doing the job.